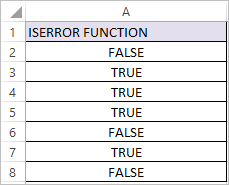 ISERROR Function in Excel identifies the Excel Errors, ISERROR Function returns TRUE if the Excel Error is identified, if not returns FALSE. In the above examples divide by 0, #N/A, #VALUE! and #NUM! are Excel errors so ISERROR Function returns TRUE. In other Cases ISERROR Function returns FALSE. The ISERROR Function returns TRUE, if the supplied value is any Excel error. 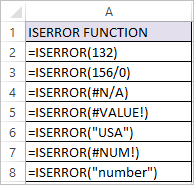 The ISERR Function returns TRUE, if the supplied value is any Excel error except #N/A.